The Gold-Ribbed Hare’s Ear nymph (GRHE) is used to represents a wide range of aquatic insect larvae. It’s useful on still water and running water for targeting numerous species including amongst others: trout, grayling, panfish, carp, roach and chub. The pattern is especially good at representing lighter coloured species of mayfly and caddis. To imitate darker insect larvae you might do better with a Pheasant Tail Nymph. In still water present the GRHE using a slow hand-twist or use a wind drift. In running water use standard nymph tactics (drag free drift, rising nymph, wet-fly swing). 1. Start the thread a short way behind the eye and wrap in close turns to the end of the shank. 2. Tie in a small bunch of guard hair to form a tail. Catch in the hair on the near side of the shank and while holding the bunch firmly allow it to roll up on top of the shank. Wrap the thread forward in touching turns being careful to keep the hair butts inline with the shank. 3. Cut away the waste hair and run the thread back to the base of the tail. Catch in the tinsel to the side of the shank and wrap the thread back toward the eye securing the tinsel aligned to the shank. Return the thread to the base of the tail. 4. Dub the thread with a blend of hare’s ear fur to form a tapered rope. 5. 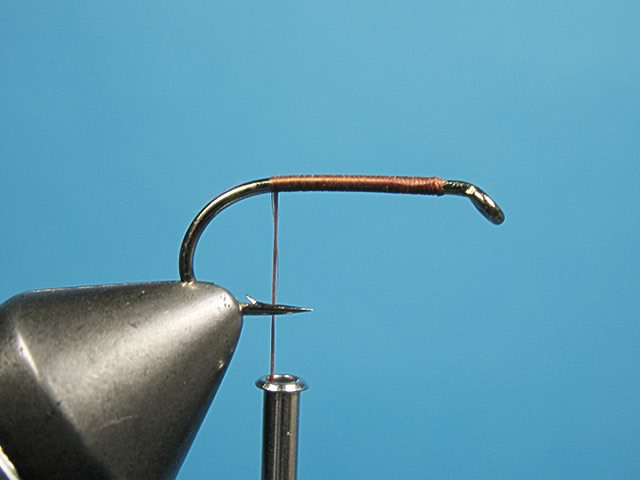 Wrap the dubbed thread forward to form a tight tapered body. 6. Hold the thread one half turn beyond the point where the bobbin hangs at the front of the body, then tease the waste fur from the thread. Put the waste fur to one side for future use. Counter wind the rib. 7. With two firm wraps of thread secure the rib, either to one side or at the bottom of the shank. Cut away the waste tinsel. 8. 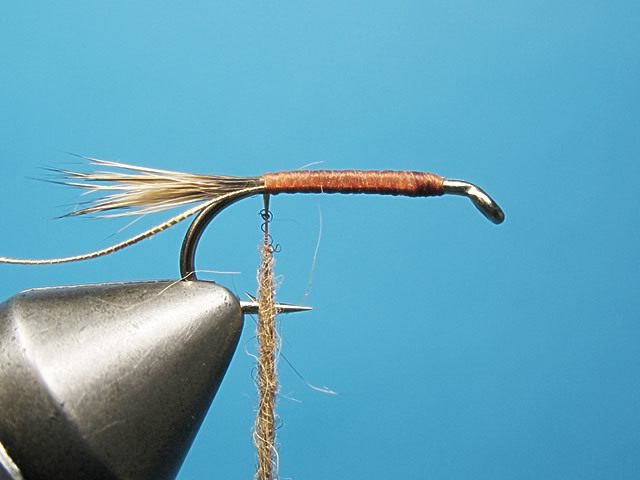 Tie in a small bunch of hen pheasant tail fibers by their tips on top of the hook just at the front of the body. 9. Dub the thread with a course mix of hare’s ear fur and wrap a spiky but tight thorax. 10. 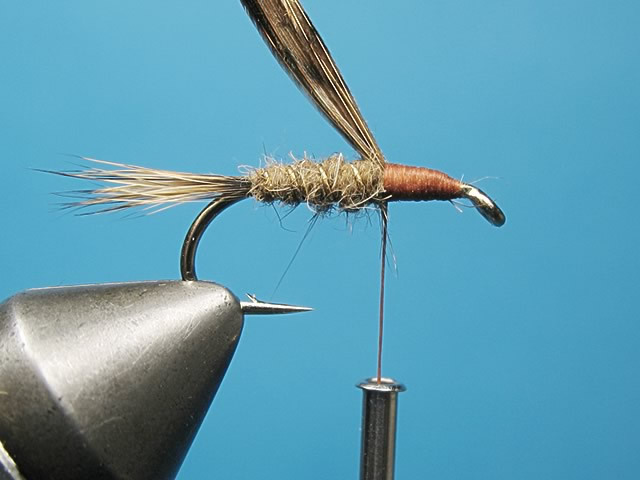 Bring the pheasant fibers forward over the thorax and while holding with moderate tension secure the feather with a couple tight wraps of thread. 11. Cut away the waste feather fibers and make a three turn whip finish. 12. Add a few drops of head cement. When the cement is dry, if you prefer, you can pick out the fur to produce a more ‘shaggy’ profile. This is best done with a piece of Velcro. 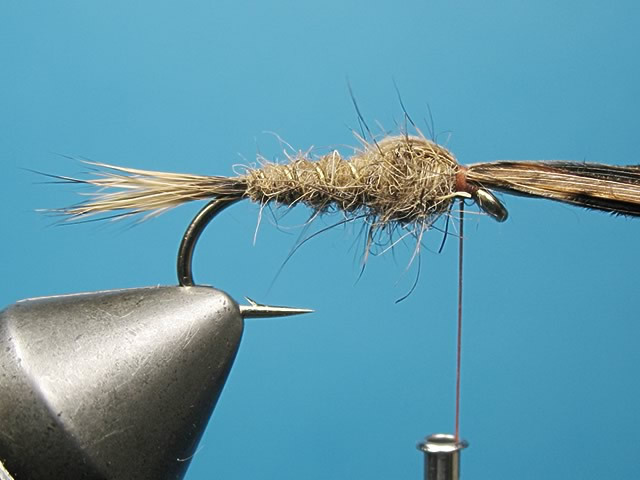 The Gold-Ribbed Hare's Ear is an old pattern referred to in many early fly-fishing journals. It was tied with a fur tail and body and with a fur 'hackle'. In its original form the GRHE was fished wet or dry. Halford dressed the pattern as a winged dry fly, while more recently the GRHE has been tied as a winged wet fly, and as a nymph having a distinct thorax with wing case. Some fly-fishers prefer to use a fly having a flat gold tinsel rib. You can also incorporate some weight under the body/thorax or use a gold bead (GRHE Goldhead). 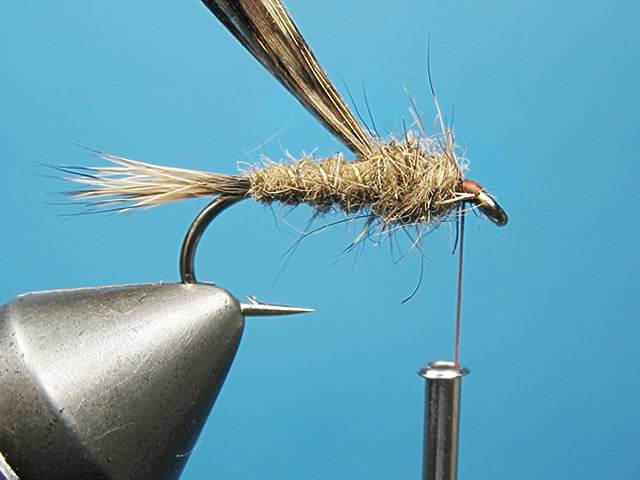 The use of different coloured tying silks can impart subtle and useful differences of hue and tone - I use brown for fishing my home waters, but black and the standard primrose are useful alternatives. You can also use dyed hare's ear for non standard GRHE nymphs, olive can be very effective, while fur can be selected from specific areas of the hare's ear and mask to create a pattern with a colour to suit your needs. Trout Fishing From All Angles, Eric Taverner, 1933, Lonsdale Library Volume II, Seeley, Service & Co.. Robson's Guide, Stillwater Trout Flies An Alphabetical Survey in Colour, Kenneth Robson, 1985, Beekay Publishers. The Fly-Fisher's Handbook, M. Greenhalgh & D. Ovenden, 2004, Domino Books.